Former Labor Secretary Elaine Chao chosen by Trump to head DOT | Freight All Kinds, Inc.
NEW YORK — Former Labor Secretary Elaine Chao has been chosen by President-elect Donald Trump to be his Secretary of Transportation. According to CNN, the official announcement on Chao, the wife of Senate Majority Leader Mitch McConnell, was to come this afternoon. 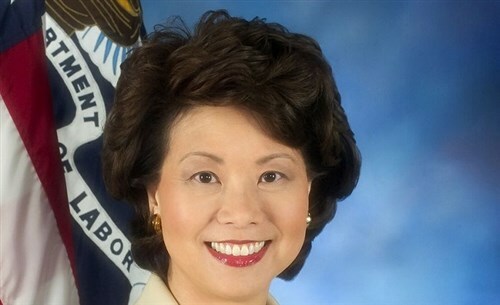 Chao was labor secretary under President George W. Bush from 2001 through 2009 and was the first Asian American woman to serve in a Cabinet position. She previously had served as deputy secretary of transportation in the George H.W. Bush administration. American Trucking Associations President and CEO Chris Spear praised Trump’s choice. Spear served as assistant secretary of policy at the Department of Labor from 2001-2004. The head of the American Association of State Highway and Transportation Officials (AASHTO) said his organization was looking forward to working with Chao and the Trump administration to fully fund the nation’s critical transportation needs and ensure a healthy and robust national transportation system. As DOT secretary, Chao she would have a major role in helping Trump get his infrastructure program rolling by getting funding for it through Congress and McConnell will be a key player in hammering out that program. A government-backed public works project has also been mentioned and she likely would be involved in that as well. The situation with her husband is not unheard of: Elizabeth Dole was DOT Secretary from 1983 to 1987 while married to Bob Dole, who was majority leader from 1985 to 1987. Chao is the oldest of six sisters and her father James S.C. Chao is a shipping magnate who reportedly gave Chao and McConnell between $5 million and $25 million in 2008 to save their stock portfolio. Under her leadership, the labor department undertook reforms by recovering back wages and monetary recoveries for pension plans and obtained record financial settlements for discrimination by federal contractors. Also during her tenure as labor secretary a West Coast port dispute in 2002 costing the U.S. economy nearly $1 billion daily was settled with a national emergency injunction against both employers and the union under the Taft-Hartley Act. After leaving the labor department Chao resumed her previous role as a fellow at the Heritage Foundation and she contributes to Fox News and other media outlets.